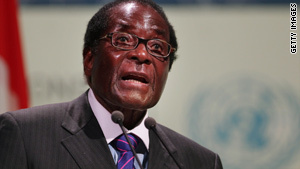 Nestle had refused milk from a farm controlled by President Robert Mugabe's family. Harare, Zimbabwe (CNN) -- Nestle, one of the world's largest food companies, has reopened its factory in Zimbabwe after receiving assurances from the government that its business will not be interfered with again, an official with the Swiss-based company said Tuesday. The company shut its Harare factory last month, complaining of harassment by authorities after it refused to take milk supplies from a farm that had been taken over by President Robert Mugabe's family as part of his controversial land reform program. "On the basis of the written assurances given by the Minister of Industry and Commerce of Zimbabwe to guarantee the security of Nestle management and staff and not to interfere in the company's operating processes, Nestle decided to restart the activities at its Harare factory," said Brinda Chiniah with Nestle Equatorial African Region's corporate communications department. "The company reiterates its commitment to source milk exclusively from its contracted farmers," Chiniah's statement added. Minister of industry and commerce of Zimbabwe, Welshman Ncube, confirmed that he held meetings with Nestle management. "I was assigned by my superiors to have meetings with them, and I assured them that their concerns will be addressed. We cannot afford to lose investors at this stage when we are rebuilding the economy," Ncube said. The Nestle shutdown was seen by many as a setback to the country's efforts to attract foreign investors to help shore up its battered economy. Operations were under way as normal at the Nestle plant in Harare on Tuesday. Nestle said last month its decision to shut the facility was prompted by an unannounced visit from government officials and police December 19, after which the firm was forced to accept a milk delivery from non-contracted suppliers. Two of its managers, including expatriate managing director Heath Tilley, were questioned by police and released without charge the same day. Chiniah said Nestle had been in Zimbabwe for 50 years and employs more than 200 people in the southern African nation, adding that the company was "working with the population of Zimbabwe and striving to maintain a long-term viable operation in often challenging conditions. "We operate in Zimbabwe, as we do in every country, through good times and bad. We work for the long-term, in a way which has positive impact on our consumers, employees and suppliers," Chiniah said. Nestle stopped buying milk from Gushungo Dairy Estate, owned by Mugabe's family, in October, following international criticism of a deal it had agreed to earlier in the year to use the farm as a supplier. The farm had been seized under Mugabe's controversial land reform program, which targets mainly the properties of white farmers. Critics say Mugabe's seizure of white-owned commercial farms to resettle landless black Zimbabweans -- who have no farming experience -- has ruined the country's once-prosperous economy. Mugabe, in power since independence from Great Britain in 1980, denies the charge, and says the economic crisis is due to sanctions imposed by Western nations in response to his land reform.